Contact lenses are one of the miracles of modern technology. Today, more than three million people in the UK enjoy the clear, natural and unobstructed vision offered by contact lenses which have none of the problems of getting fogged up or splashed with rain as glasses sometimes do. New lens designs and materials, as well as advanced care products, now make contact lenses easier, more comfortable and safer to wear than ever before. They offer much greater freedom when playing sport, and can help you look great for that special occasion. They particularly benefit individuals who have stronger prescriptions and thicker glasses. 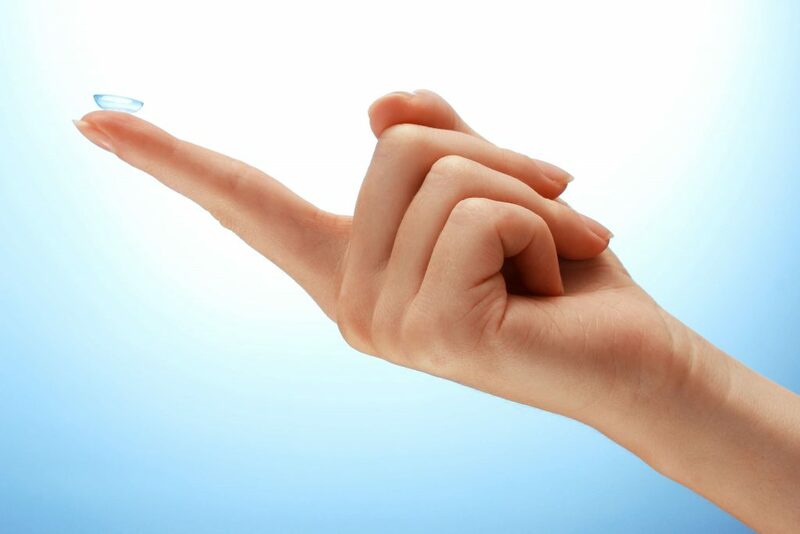 Are Contact Lenses Rights For Me? Common eyesight defects – such as short-sightedness and long-sightedness – are easily corrected with contact lenses, but now conditions such as astigmatism and presbyopia can also be treated very effectively. In the past, people with astigmatism, (where the cornea is more oval than round, causing distortion of vision) were restricted to wearing glasses. Today’s ‘toric’ contact lenses can correct this and be custom made for each individual to provide clear vision. Many of these can now be ordered from stock and be available to wear in just a few days. Presbyopia, gradually affects everyone over the age of about 40, making it difficult to shift focus between near and distant objects; this condition can also be managed with contact lenses. As contact lenses are worn on the surface of your eye, there’s nothing to obstruct your peripheral vision in the way that spectacle frames might. As your eyes move, the lenses move too, so that you’re always looking through the centre, where your vision is best. In many cases, people actually see better with contact lenses than they do with their glasses. All contact lenses, whether cosmetic or with a prescription, must be fitted by a qualified practitioner, so before you can wear contact lenses you must have your eyes examined. During the eye examination the health of your eyes, inside and out, will be checked and your spectacle prescription determined. The quality of your tears, needed to keep your lenses comfortable, will also be assessed. A number of measurements will be taken for each eye, including the corneal curvature and diameter. Based on this information, your practitioner will be able to advise you about the most suitable contact lenses and offer a free trial. These are small lenses, which allow the passage of oxygen through to the surface of the eye. They are made of firmer plastics than soft lenses, which makes them more durable and longer lasting. These lenses are particularly suitable for certain prescriptions such as high degrees of astigmatism. Some people find RGP lenses easier to handle than soft lenses and, although they may take a little longer to get used to, regular wearers find them just as comfortable as soft lenses. Tinted contact lenses, which can enhance or change the colour of your eyes without affecting what you see, are now widely available. The latest lenses are made from materials known as silicone hydrogels, which allow around six times more oxygen to reach the eye compared to ordinary soft senses. They are available to correct myopia (short-sightedness) and hyperopia (long-sightedness) and more recently, astigmatism. They may be prescribed for daily wear or for overnight use depending on your needs and suitability. Soft contact lenses are made from gel-like plastics, often with a high water content, that allows oxygen to pass more freely to the eye. Like the silicone hydrogels, they are much larger and sit on the sclera (the white of the eye), which in turn makes them very comfortable and easy to adapt to. Most contact lens wearers have the option of choosing from daily disposable, weekly wear, monthly or 3 monthly replacement lenses. Always ensure you wear, and care for, your lenses in accordance with your practitioner’s instructions.